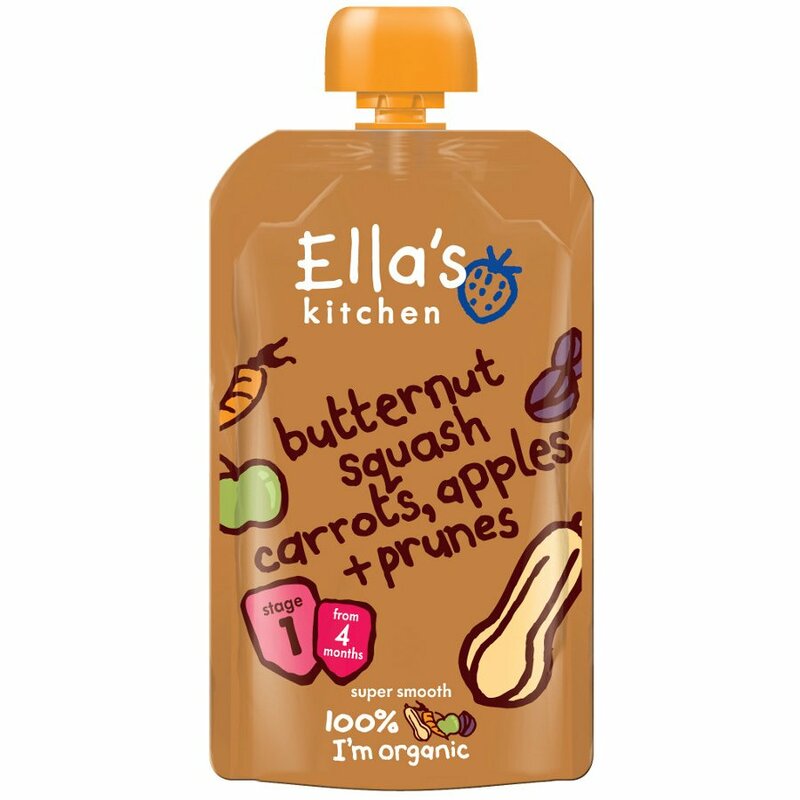 Ella’s Kitchen have developed a fantastic range of baby foods that are very different from anything else on the supermarket shelves, minimally processed and containing nothing other than puréed organic fruit and vegetables. There has been absolutely nothing else added to this Butternut Squash, Carrot, Apples and Prunes pouch except what's in the name. Just 100% organic fruit and veg with nothing to dilute its goodness, not even water. And because the pack is so easily squeezy it’s just as handy out and about as at home. Tasty cold or warmed up, although the pouch should never be put in a microwave. NHS UK advise that weaning should start when your baby is around 6 months old, however, if you feel your baby is ready to wean but is younger have a chat with your health visitor or GP. The Ella's Kitchen Butternut Squash Carrot Apples & Prunes - 120g product ethics are indicated below. To learn more about these product ethics and to see related products, follow the links below. Good as a one off when realise nothing in cupboard for dinner/lunch or dashing out the door. Ella's Kitchen is by far the best instant baby food. Great for travelling. 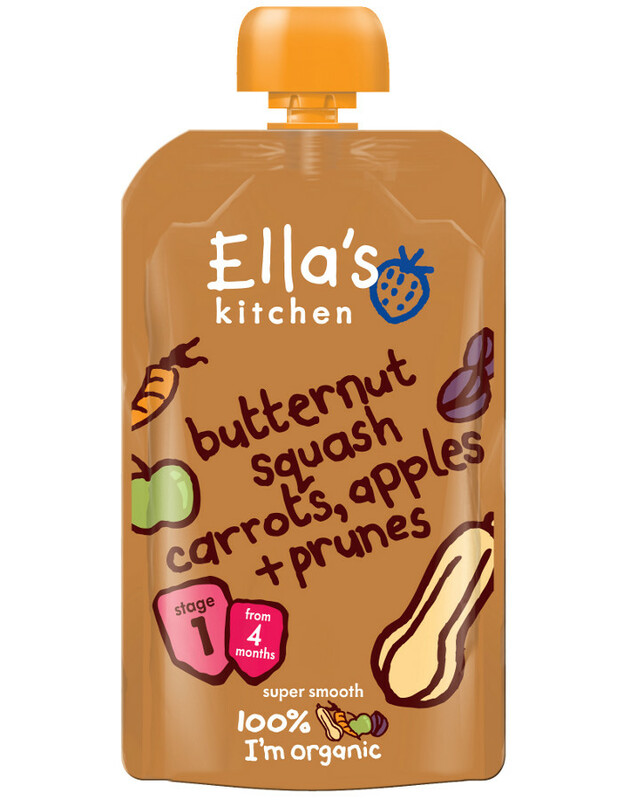 There are currently no questions to display about Ella's Kitchen Butternut Squash Carrot Apples & Prunes - 120g. Ella’s Kitchen is a new and innovative UK based company which offers a fantastic range of healthy fruity snacks, smoothies and savoury vegetable sauces, designed especially with kids in mind. It is the brain-child of Paul Lindley, the father of eight year old Ella, who decided as a parent that children needed more opportunities for fun and tasty food than looks good and is healthy too. Ella's kitchen uses 100% Soil Association certified organic fruit and vegetables, so their products are positively oozing with goodness. There is no added sugar or salt, no E numbers or GM products, and no concentrates used as substitutes for real wholesome ingredients. Their range includes Stage 1 baby foods as well as tasty squeezable snacks for older kids. Just as handy out and about as at home, these are certainly worth trying.